If you haven't already read about the Bookish March Madness event that I'm doing with two colleagues, check out my first post. 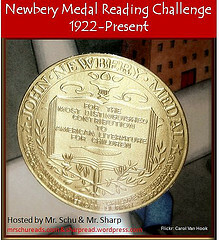 There, I describe the process we used to select the 32 books for our challenge. The students from the five schools represented in this event are all upper elementary gifted students. Thus, our selections may be slightly different than other 4th and 5th graders would pick. Honestly, though, I think it's only slightly different. Most of the books that made it to our brackets are books I've seen many other kids cradling to their chests and stuffing joyfully into their backpacks. I'm thankful for my colleagues - one of the other teachers actually made the bracket paper. We discussed a few things we wanted to see in the brackets before she began, though. 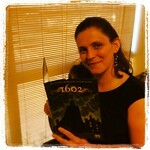 "In putting together the brackets, I tried to match up genres. So for the first round, almost all of the pairs facing each other are the same genre. Or if I didn't have an even number of books in one genre, I may have paired up 2 closest genres like a realistic fiction with a nonfiction. Of course there were a few books that I have not read and so the pairing may be an odd one, like Horton Halfpott and The Name of the Book is Secret. Also, since we were fantasy heavy, I made the top left bracket all fantasy. Even within fantasy I matched up books that I thought might have a similar audience. I matched up the Harry Potters and 2 of the Riordan books in the first round to reduce those authors' presence. I also tried to group the genres with an eye to later rounds so that we'd have a decent variety of genres left in the 3rd round. The Wide Window and Lions of Little Rock are an odd pairing, but they were my last spots to fill. They got paired up by default." Click to see on Flickr! My other colleague, Erin Bushnell, sent us a document with the covers of all the books. 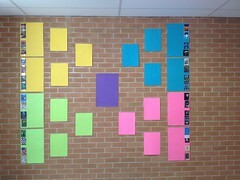 I used them to create a wall display of the bracket system to help kids visualize it. Can you tell I have a penchant for bright colors? 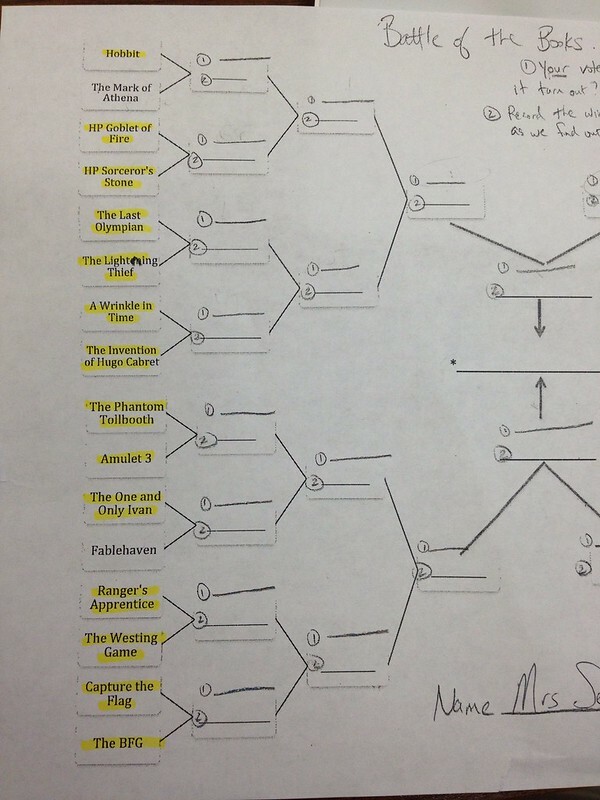 I gave my students the brackets last week, so they would have time to think about all the books - and possibly read some of the choices they haven't yet read. There was a flurry of passion, advocacy, and angst. 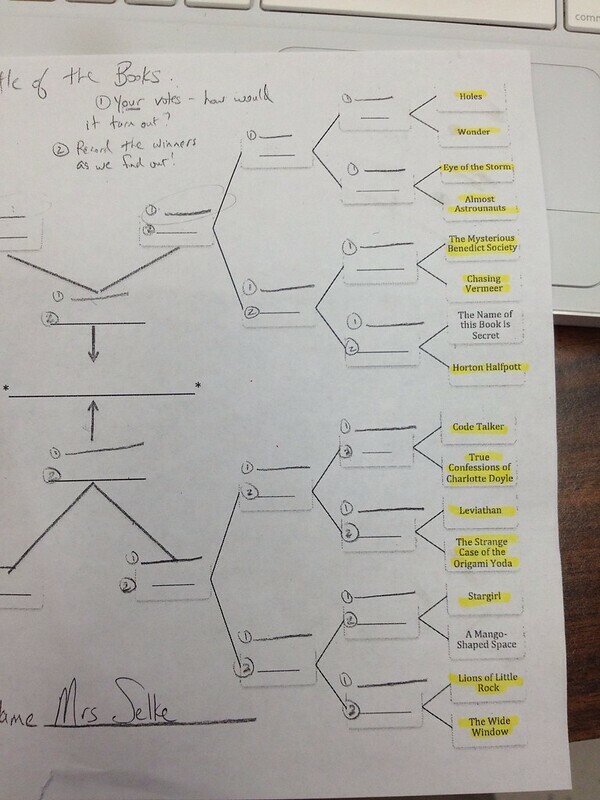 I told my students to start by completing the entire bracket as if they were the only one choosing. I wanted to know what would win in THEIR minds. Immediately, groans erupted. Then the chatter began. "How can you do this to us, Mrs. Selke?" "What will you be picking?" "I can't possibly choose between these two books!" "Hey, everybody, let's make sure we all vote for Ivan so it makes it to the next round, okay?" Several students worked their way into the center of the brackets. One began to mutter about how he couldn't possibly be expected to choose between Wrinkle in Time and Origami Yoda. Another gasped over his final choice: Wonder vs. The One and Only Ivan. Half of the fifth graders insisted they needed to read some of the books on the brackets that they haven't gotten to read yet. Copies of Code Talker flew off my shelf. Another group snagged copies of Capture the Flag. Still others started bartering for my one copy of Ivan. Ahhh... the sweet taste of success. Next time - making book commercials and the first round of voting.